We wanted to let you know that Clay tried to claim Hammer’s Bullet from the third race at Churchill today but again we lost the shake. Clay had the horse last year, won with him here, and thought he would work here against some easier competition. We don’t necessarily need another horse but this one would have fit very well in Shakopee and the opportunity was there so we let Clay take a shot. 1. Neither horse really has a barn name. They typically go by their full names or shortened abbreviations of their actual names. 2. Right now it is most likely that all horses will race in Clay Brinson’s silks. 3. Clay uses a lot of different jockeys and doesn’t have any plans set in stone for your horses at this point in time. Nik Goodwin was aboard Great Bam for his workout, so he may be the most likely candidate for him. However, Clay said he will discuss that with us further when we get closer to race day. Lastly, there is a possibility that the group will get a third horse tomorrow. There is a horse racing at Churchill that Clay has had his eye on. We’ll be sure to keep you updated if anything happens on that front. Jeff and I went back to get a closer look at Downerbythemeadow today and by all accounts she appears to be in good shape. She could stand to gain a little weight but Clay had already noticed that prior to claiming her. She walked the shed row today and will likely do that again for another day or two which is typical of any horse following a race. Above you can see her in her stall this morning after her walk. 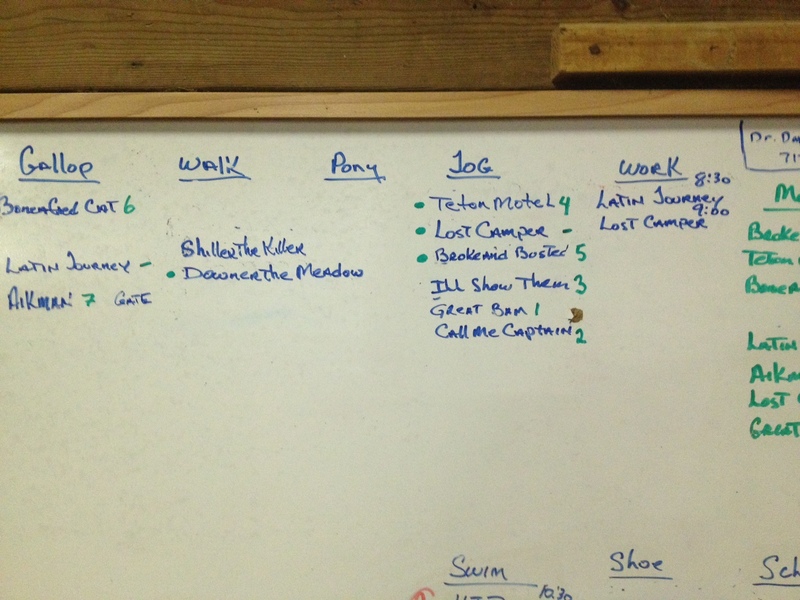 Additionally, Jeff took a picture of Clay’s daily work board to show you the plan he had today for all of his horses. You’ll see Downerbythemeadow listed under walk and Great Bam listed under jog. Hope you are all enjoying a great holiday weekend! Please continue to post any questions you might have in the comments below. Well, after multiple attempts, we have finally secured a second horse for the Club. The club claimed #2 Downerbythemeadow out of tonight’s second race for $3,500. She has won 6 times from 30 lifetime starts and three of those victories have come here at Canterbury Park. Tonight, she finished third behind Havasu and Lovely Tak and that is actually a good thing for us as she remains eligible for more races than if she would have won. Jeff and I will go back tomorrow to try to get a better look at her and give you Clay’s report on how she came out of the race. Clay had a chance to look over her prior to the race and agreed that she gave us some options as to where we could race her next. Check out this link to watch a replay of tonight’s race. Congratulations on getting a second horse! Jeff went back and talked to Clay this morning and reported that Great Bam went back to the track yesterday (Wednesday) and jogged both yesterday and today. So far, so good and no problems to report. 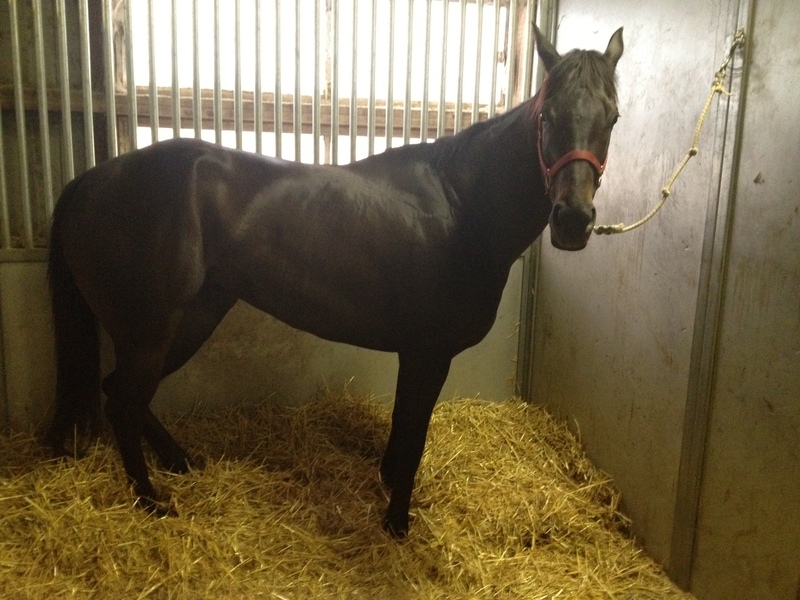 They plan on galloping him tomorrow in hopes of getting him ready for a workout early next week. The break in training will keep him out of a potential race on Monday. Looking through the Condition Book the next possibility will likely be on June 8 or June 10. On June 8, there is a $10,000 non-winner of two lifetime and on June 10 there is a $5,000 non-winner of two lifetime. So far, the $10,000 race has failed to fill. We’ll have to play it by ear when the it comes time to enter him in a race. Options may be limited to the claiming price that draws enough runners to be used. Jeff and I spoke with trainer Clay Brinson yesterday and he reported the horse experienced a set back during training yesterday. Clay said that Great Bam was out for a gallop and the exercise rider noticed that he was bleeding from the nose while galloping. Although this sounds bad, it is relatively common for horses to suffer from a condition known as Exercise Induced Pulmonary Hemorrhage (read more about EIPH here). As a precaution, Clay had a vet examine him after returning to the barn to determine if there was a larger problem. The vet reported that everything looked fine and placed Bam on antibiotics to avoid an infection. Clay said that he plans on giving Great Bam a couple of days off before returning to the track. He’ll continue to keep a close eye on him and will let us know if anything changes. Obviously, the inability to go to the track for the next couple of days makes it less likely that he’ll be able to race next weekend. However, we’ll let Clay continue to monitor his progress and let us know when he’ll be ready to race. On the subject of finding another horse, Clay told us that he is looking a horse at Churchill that he used to train that may be available for purchase. Additionally, he’s looking at horses he might be able to claim here. Racing is a game of up and downs. It’s easy to ride the waves of emotion but sometimes you need to try to keep an even keel. Jeff and I went back to talk to Clay about the horse, his plans and what race he believes is best for Great Bam. If you did not read the previous post, it may be helpful to go back and take a look. The explanations of types of races will help you when going through this post. As you heard in the video, Clay has picked out two races that are possibilities, one on May 25 and another on May 28. The plan for right now is to enter the one on May 25, and if it doesn’t draw enough horses, go in the race on May 28 which we hope will have enough horses. Obviously, we won’t know what happens until entries are taken for those days. Entries for Friday, May 25 will be taken a week from today and entries for May 28 will be taken a week from Friday. The races are nearly identical in that they are both sprints for horses that have not won two races lifetime; however, the race on Friday, May 25 carries a $10,000 claiming price while the race on May 28 carries a $5,000 claiming price. You’ll notice that the purse is $9,000 (to be split amongst all runners in the race), the race is for horses three years old and up, the claiming price is $10,000 and the race will be run at a distance of six furlongs on the main track. You’ll notice that the purse is $7,000 (to be split amongst all runners in the race), the race is for horses three years old and up, the claiming price is $5,000 and the race will be run at a distance of five and one half furlongs on the main track. It’s likely that both races will not go, so we’ll have to play it by ear. Clay will be on top of the situation and will keep us abreast if anything changes. Please post comments or questions that you may have about the condition book, these specific races or anything else that interests you. We hope that all of you are enjoying a wonderful Mothers’ Day.